Yield: Yields one 9-inch tart. This tart crust is every pastry-phobe’s dream: you pat it into the pan—no rolling involved. In a medium bowl, whisk 1/3 cup of the sugar and the cornstarch, kosher salt, and lemon zest. Add the plums and gently toss with your hands to evenly coat with sugar. Cover the bowl and put it in the refrigerator for at least 3 hours or overnight. Lightly butter the bottom and sides of a 9-1/2-inch fluted tart pan with a removable bottom. Put the butter cubes in the freezer. In a small bowl, whisk the egg yolk, lemon zest, and vanilla. Put the flour, sugar, and table salt in the bowl of a food processor and pulse a few times to combine. Add the butter and pulse until the mixture is crumbly and mealy, about 25 short pulses. Add the egg yolk mixture and blend, using long pulses, just until it forms a moist, crumbly mass, about 15 three-second pulses. The dough won’t come together on its own, but it should hold together when squeezed. Transfer the dough to the tart pan. Dip the bottom of a flat-bottomed cup measure in flour and use it to press the dough onto the bottom and sides of the pan in an even layer. Start with the sides, which should be 1/4 inch thick. Reflour the cup whenever it starts to stick to the dough. Wrap the pan in plastic and refrigerate it for at least 1 hour and up to 1 day. Position a rack in the lower third of the oven and heat the oven to 375°F. Unwrap the tart shell and prick the bottom and sides several times with a fork. Spray one side of a piece of parchment or foil with cooking spray. Line the shell with the sprayed side down and fill the lined shell with pie weights or dry beans. Set the tart pan on a baking sheet and bake for 20 minutes. Carefully remove the liner and pie weights. Should any dough stick to the liner, simply peel it off and patch it back into the shell. Reduce the heat to 350°F and continue baking until the sides and bottom of the shell are golden brown and dry, 10 to 15 minutes more. Cool on a rack for about 20 minutes. Drain the plums in a sieve or colander set over a medium bowl for a few minutes. Pour the juice into a small saucepan and bring to a simmer over medium heat. Reduce the heat to low and simmer, stirring occasionally, until very thick, about 3 minutes. Scrape into a small bowl and let cool for about 10 minutes. Meanwhile, melt the preserves in the saucepan over medium-low heat until syrupy. Pour the preserves into the tart shell and evenly brush them over the bottom and sides. With a rubber spatula, spread the plum juice over the preserves on the bottom of the shell. Starting at the edge of the shell, arrange the plum slices cut side down and tightly overlapping in concentric circles. If you have more slices, keep tucking them in wherever they fit. You can also pile a few in the center of the tart. If any juice remains in the mixing bowl, drizzle up to 1 Tbs. over the plums. Discard the rest. Sprinkle the remaining 1/2 Tbs. sugar over the plums. 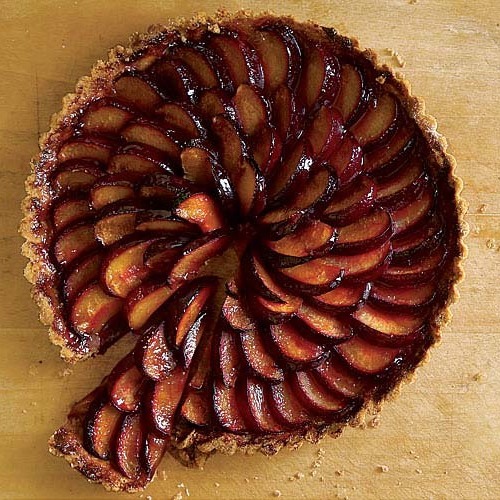 Bake the tart directly on the oven rack until the plums are tender when poked with a paring knife and caramelized along their edges (a few tips may even blacken), the crust is a deep golden brown, and any juices look syrupy and bubbly, 40 to 50 minutes. After you remove the tart from the oven, moisten the plums by dipping a pastry brush into the juices between the plums and brushing any surfaces that look dry. Cool the tart in its pan on a rack for at least 2 hours before unmolding and slicing with a very sharp knife. 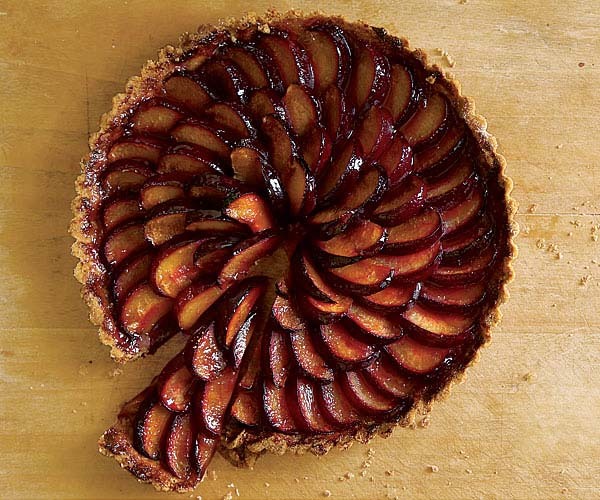 You can toss the plums with the sugar mixture and chill the unbaked tart shell up to a day in advance. Delicious! I will make this again. My tart pan is a little larger and it stretched just fine. I used raspberry preserves, also delicious. It takes a lot of time to rest between steps. Lots of little extra steps. Not difficult, and useful to have proper equipment like the food processor. But worth taking the time to do it right. I've made this three or four times and consider it a summer tradition now. I love the lemony flavour mentioned by others but I'm a huge lemon fan - if you go for curds the quantity is probably just right. A lovely dessert that my guests have consistently enjoyed. Loved it....but I have found the majic ingredient for strawberry, raspberry or plum desserts instead of lemon/lemon zest...balsamic vinegar. Even add it to homemade jam now. Adds a touch of brightness without the citrus overtones....and nobody can ever tell what it is. Add 1/4 tsp of balsamic vinegar to the plums. Great. Delicious, looks so impressive, and is surprisingly easy to make. I heeded the advice of the others here and halved the lemon zest in the crust to a single teaspoon--it tasted PERFECT this way, but any more would've been overkill.